After our brief motherboard roundup, it was brought to our attention that some of the next generation of Intel motherboards are now up for pre-order in China. 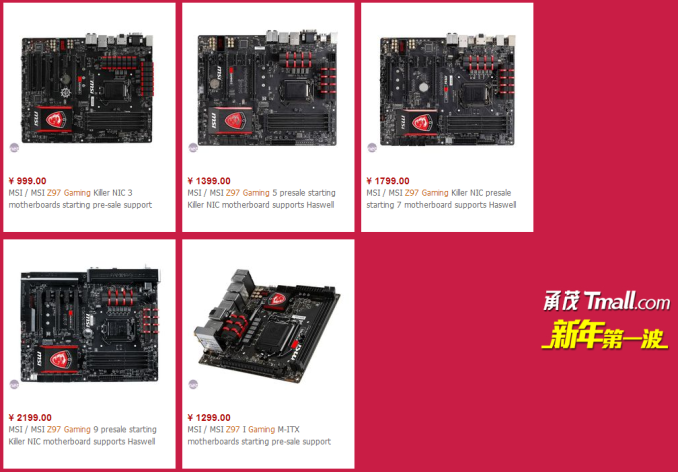 From tmall.com, it seems that motherboards described as being from MSI’s 'Z97' Gaming line up are on offer for pre-order from ¥999 ($160) to ¥2199 ($350). Given that these seem to be ahead of any official launch, the translated text states that these motherboards will be shipping in May. Almost ironically, the images used for these motherboards were taken from media reports on the MSI range with the chipset markings covered up. Not many specifications are given above and beyond what we know already from the images MSI has allowed the media to publish. The seller does liberally put ‘Haswell Refresh Z97’ on most of the products. We do have the phrase ‘Expected delivery time May 30’ on each of the items as well. The advantages of putting items up for pre-order mean that early adopters can ensure a copy and know what is coming. It happens in the video game industry, where users know what is coming months in advance, or even in mobile phones where a big press event is held a month before launch - but not in the computer hardware industry. Normally motherboard retailers should be holding back from selling until launch, however if any of them get stock you might imagine that it would be beneficial to business to sell it now (or take preorders) than keep it in their storehouse. "Almost ironically, the images used for these motherboards were taken from media reports on the MSI range with the chipset markings covered up." "The advantages of putting items up for pre-order mean that early adopters can ensure a copy and know what is coming. It happens in the video game industry, where users know what is coming months in advance, or even in mobile phones where a big press event is held a month before launch - but not in the computer hardware industry."